PhoneGap은 현재 Xcode4용 템플릿을 제공하지 않는다. 대신 Xcode4용 프로젝트를 만들어 준다. 여기로 가서 프로젝트 이름을 넣으면 압축 파일을 하나 만들어 준다. 이 파일 안에 Xcode4용 프로젝트 파일이 들어 있다. 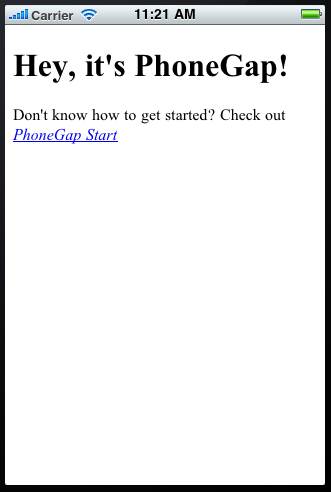 처음 PhoneGap 프로젝트를 만든 경우, Source Trees에 PHONEGAPLIB를 만들고 Path에 ~/Documents/PhoneGapLib를 입력한다. 나처럼 Dropbox를 이용하는 경우에는 ~/Dropbox/PhoneGapLib를 입력한다. 이 디렉토리가 없다구? 그렇다면 여기에서 PhoneGap 설치 파일을 받아서 iOS 디렉토리에 있는 설치 파일을 실행한다. iPhone Simulator로 target을 설정하고 컴파일 후 실행해보자. This entry was posted on May 4, 2011 at 11:19 am and is filed under iOS. You can follow any responses to this entry through the RSS 2.0 feed. Responses are currently closed, but you can trackback from your own site.